Congratulations Linda. 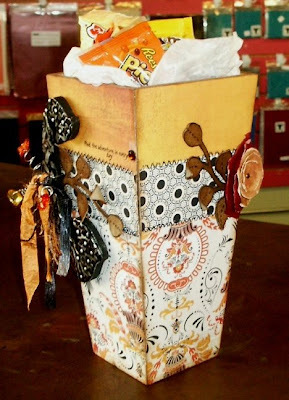 You are the winner of $25.00 worth of product from the Crafty Scrapper. Here is what Linda did with the October kit. I love the way she incorporated the map and little playing card so perfectly. The colors worked out really well for these pictures. Here is where the kit is displyed. You will see how Linda used these items so creatively. So what's next? The November Kit named Autumn Treats is in the store (both online store and the brick & mortar store). The colors of this kit are more standard fall colors-browns, oranges, reds. The kit was put together keeping in mind all the activities that take place in the fall. Halloween, Hikes, Football, Thanksgiving, etc. You'll see that there are some fun fibers & ribbons, stamping tool, chipboard words and vintage items along with the papers. For this kit, we'll do the same as we offered in October. Complete a project using this month's kit. Send pictures or link to us by midnight November 30, 2008. We will draw a name randomly & that person will win product from the Store. Hope you are enjoying some cooler weather and lots of fun activities. This month is coming to an end. This means a lot of different things. Bills might be due, reports might be due. This month Halloween occurs. The thing I am looking forward to is the fact that the OCTOBER KIT CHALLENGE participants will turn in their projects. We know how many kits sell each month, but never know how many will turn in pictures of their projects. We know that the duties of life can interfere with the plans to scrapbook. We know that sometimes people don't think their projects are presentable. We know that the end of the month can sneak up on people. SOOO, with all of those things in mind, I want to encourage you to finish your project, to do that thing that has been popping around in your head for the month and to send the pictures to us. This month the winner will be picked by a number pull. If one person submits, well then guess who will win? In months past, the most we have had submit is five. So even with that, your odds are VERY good for winning. A couple of classes that are becoming more popular by the month are the classes for the Cricut. Several people had Cricuts, but either had never used them or wanted to learn more about them and all were just excited about taking a class like this. The classes are led by Heidi. In the beginners or basic class the students learn basic functions of the machine. Several who had used theirs before found out several things that they didn't know until they took the class. The group makes a project using only the Cricut and the basic cartridge that comes with it. The other class that has been offered is a cartridge class. This is set up like a book club. Each month the group decides what cartridge they would like to learn about the next month. Those who want the cartridge order it through the store and sign up for the class. At the next month's meeting, the explore this new cartridge making a project with only that cartridge. Some of the cartridges that have been done are Graphically Speaking, Story Time and Joys of the Season. It is not necessary to take every cartridge class and new people are just fine at any time. It is suggested that they take the basics class before doing a cartridge class. We are thinking that more of you will get these machines. Perhaps Santa will be bringing one to you? We are planning to continue the classes in 2009 learning as much as we can about them. Check out the events page on the store's website for class information. Feel free to ask about these next time you visit the store as well. Before you guys blast me and tell me Halloween isn't even here yet, like my husband did, hear me out! Being in retail as many years as I have, when all the stores around you start changing out their windows, you feel the pressure to do so too. We even put out Christmas paper early this year and have already sold out, so we decided to buy more collections. Again this year there will be the Christmas table with the Top 10 ideas from the design team, and some have already arrived to the store. We also have some ornament ideas with templates. Sherri made this banner from Maya Road acrylic house album, chipboard letters and scrolls, she also played with the applique pen. Betty brought these adorable candles in that she made using what she learned from Wendy Vecchi with grunge board. Annette totally grunged up this desk calendar/note pad set with some Graphic 45. These calendar sets will be for sale. This is my new favorite window! I wanted something with only white, silver and brown. Two "HOT" things this year seemed to be owls and clocks, so thats what I used. My new white friend is Snow. This was last years favorite window, I still love this window and even added some new balls! And believe it or not, there is still alot more to come......................Basic Grey, October Afternoon, Making Memories, K&Co., Imaginise and more CI. Remember Santa is watching you........who is naughty or nice! 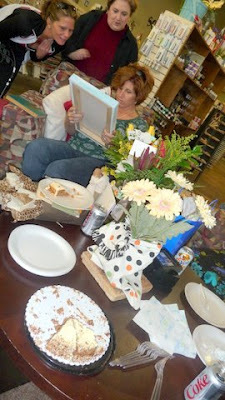 Over the weekend of the 10th to 12th, the store had Wendy Vecchi teaching several classes. The Maya Road Design Team also came in for the weekend. They shared some ideas and took some classes too. It was a busy, fun weekend. Knowing that they were coming, Carolyn thought it would be neat to make each of the group a box or something that could be filled with some candy and given to them as a welcome. Several of the design team worked on these. I think they turned out pretty neat and am sharing them here as ideas to springboard off of. Carolyn made this vase for Caroline. It turned out really great and you don't ever get the full effect from a photo. 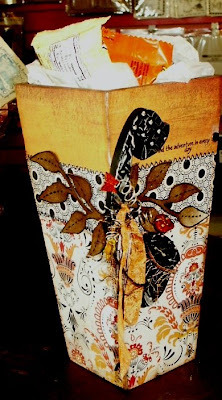 This one was done by Annette for Wendy Vecchi. She used one of the flower boxes by Maya Road for this and personalized it with her own items. Heidi decorated this Provo Tin for Aubrey. She used a lot of ink techniques along with paper on this tin. Sherri decorated an old cigar box for Lisa Pace. The majority of the items used are old ephemera from her stash. This one was for Jessica. It is a box with smaller box trays inside. There are Sassafrass Lass papers on here as well as prima flowers and page bubbles. Hope you find some inspiration here. Let us know what you have made. 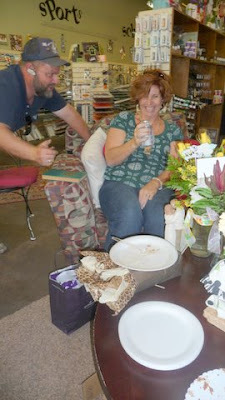 Will we were at it again, another fun filled event at the Crafty Scrapper. This was our 4th annual Halloween Crop. We started the morning off will some creepy fresh donuts and fruit........ As usual MaryLou surprised us with her fun will thought out costume, its always fun to see what she comes up with.........hey Caroline, that's Maya Road mist she used on her pants! Sandra and I received our hats from the same witches school.................... These two are very happy with their prizes for finishing the Halloween owl riddle book first. This projected was created by Isla Jones, who couldn't attend and was very missed! And of course our regulars working on Holiday projects.............Oh is that Sherri covering her face! I was even able to work on a class project, this is for our 3rd annual Christmas Cookie Exchange Class. I used the Maya Road Air Mail, BoBunny's new Christmas collection, I also added what I learned from Wendy Vecchi with the grunge board Christmas trees. And of course I had to add some of my favorite metal goodies. We will starting taking sign ups for this popular class....its like a Christmas party. You bring cookies, and recipe cards to swap with the girls and take this adorable class. When you leave you have a basket of yummy cookies, 12 new recipes and this holder to keep them in. Remember this class fills up fast. Five people joined in the challenge with the September kit. Participant number one is the winner of $40 worth of Maya Road product that was offered as a prize. Caroline Lau and her design team selected the winner. 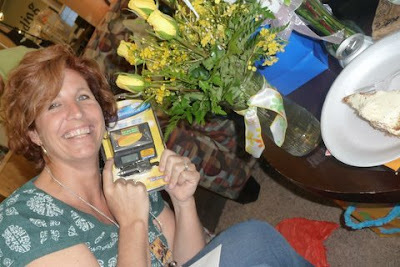 Caroline also personally picked out the prizes to be given. They said that they picked participant one. Who is participant one? It's SONIA. Congratulations Sonia. There is a package at the store for you with these items. Sonia did a 2 page layout, a one page layout and a tag. To see hers and all the entries, please check them out on the Gallery under Challenges, September Kit. Thanks to all five of you who played this challenge. I will attempt to get the file names on the gallery changed to reflect the names of those who participated. Each month seems to grow a little bit more. Don't forget to check out the kit and challenge for October. Wendy Vecchi's classes started today and the store was packed with people excited to learn new things. I feel like its been fast and crazy and I am working on no sleep, so I thought I would post a few pictures for now and more in a few days when I can think clearly. Wendy started the day off with the Ranger technique class. I actually was able to attend half of the class.....all I can say is it was amazing. I was shocked at all the new things I learned and just LOVE her new stamps. I slipped in a seat next to Lisa Pace, my new BFF, and have decided to always sit next to her when taking a class. I got called away a few times, but Lisa kept me updated and helped me get caught up. Caroline settled in on the other side were our other class room is, and finished two awesome albums. At one time she came up to me and asked for coffee filters, when I went to go check on her she had mist them with their new Maya Road misters and created these beautiful flowers. Then a hour later she said she saw some old books under my art bar, could she have one, again I checked on her and she had made more awesome flowers. So between Wendy and Caroline I feel like I learned a TON! Later when I post more pictures I will share her finished projects. We ended the day with a fun dinner out and my buddy Megan from Ten Seconds Studio even drove down to join us. 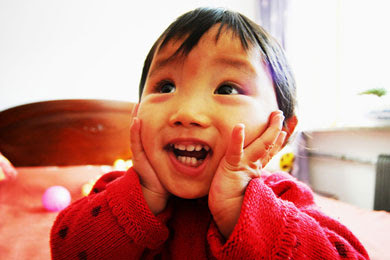 I am so excited that Megan and her mom are coming back tomorrow to take the class and play with us. Tomorrow we are doing 2 more classes....what a fun weekend! 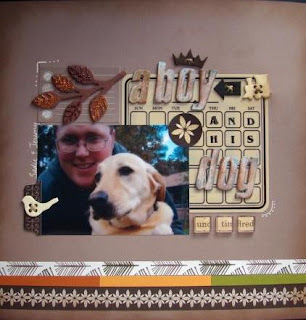 This chipboard album was so much fun to use. The cover of the album actually comes apart to make a frame. You can then use the gears in all sorts of creative ways. I backed some of the gears with papers. I also used the cuttlebug to emboss the letters. I wish you could see how shiney everything is with the Maya Mist. The rest of the album is on my blog. I hope this will inspire you to try one of these little cuties. ...and Wendy will be here. Wendy Vecchi is a full time artist/designer and a Certified Ranger Educator. She is also a member of the Maya Road design team. She recenlty designed some fun rubber stamps made by Stampers Anonymous. We met Wendy at Winter CHA and feel in love with her work and personality, she became Annette's idol. Friday night, Wendy along with the Maya Road Design Team will be at the store. There will not be a regular crop night. Instead, there is a special rate to join this group for supper and a great make and take. What a nice way to end a stressful week. Only $20 for it all! Starting Saturday, Wendy will share TONS of information and show how to use the Distress Inks in a FUN Techniques class. Techniques include the best way to use the blending tool as well as the mini misters. She will use the same format that was used @ Ranger U. Each technique will be done on a manila tags & you will leave with a set of tags that makes a wonderful reference for future play. No note taking will be needed, as each tag will be labeled with full instructions on how each technique was done. This class is being held on Saturday at 10:00am and on Sunday at 4:30 pm. The class is three and a half hours. It is a bargain at $45.00. The second class to be given by Wendy on Saturday is one using grungeboard to make a wonderful holiday decorative piece pictued above. Use some brand new stamps and learn tips and tricks to using grungeboard. Wendy is an expert in using it and has some wonderful designs that she has made from the grungeboard. This class is only $30.00. Sunday at noon is this great class using fragments. By using scrap pieces of paper and supplies provided by Wendy, the participants will make a great journal with this fabulous cover. This class is $45.00. Contact the store to sign up for the crop and/or any of the classes. There are only a few openings for the classes. There is a supply list at the store and under the events page on our website. Don't miss this great opportunity. We had to extend the deadline for the September Kit Challenge to October 13. See the full details of the challenge here. What this means is that many still have time to complete a project or layout and submit pictures to us. It also means that those who have already turned in project pictures have to wait another 10 days or so to find out who will win the Maya Road Products that are being given by Maya Road. Caroline Lau, co-owner of Maya Road picked out $40.00 worth of product to be given away to the person that the Maya Road design team chooses as the winner. The October challenge is on track and is due the end of the month. The winner for that will be chosen by random number draw (generator). Thanks for participating in the challenges and just ask if there are any questions! I guess I cannot call him my baby anymore. I found some old pictures the other day when he was little and just could not believe how time has flown by. We had his party at Flip Fusion in Waxahachie, and it was perfect and easy. You moms know what I mean by easy! As you can see all his friends and cousins showed up to help him celebrate, and boy were they worn out and sweaty. Thank you so much for coming and helping us celebrate his birthday! 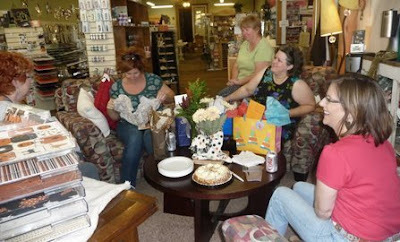 Now all of us at the store are getting busy getting ready for Wendy Vecchi. Not only is she coming, but Caroline from Maya Road and 3 of her DT members. We are making it a big fun weekend. Wendy decided to send some extra kits, so if you didn't get signed up, you still have time.